When I was 15, my older brother gave me my first real stereo. I loved it. It was amazing to me. The amp was an Akai integrated, a brushed aluminum beauty with a lot of aluminum knobs and dials. It had very cool VU meters and a walnut case. The turntable was equally beautiful, also Japanese. It was a Kenwood with a granite-like finish and a very deliberate looking tonearm. The speakers were made by Realistic, and like most speakers of that time, housed in sealed particle board boxes, carefully veneered in a teak finish. I used to lay in bed when it was too late to turn the stereo on, and stare at its beauty. I don’t know how long I had them before the magic wore off but it was years, of that I’m sure. Since that time, I would conservatively estimate I’ve owned 12-15 sets of speakers, from Tannoy and Mission to Scientific Fidelity. But none of them quite as beautiful as the speakers that stand proudly in front of me today which made me think… the golden ratio is a mathematical ratio that is frequently found in nature. It’s been adopted in art and design for centuries. Its organic and natural works are visually pleasing. After my customary sitting and staring at the speaker, I broke out my tape measure and calculator. These Lamborghini black transducers are dangerously close to falling within the golden ratio. Their narrow face and deep profile are, to my eyes, near perfection in proportion. EgglestonWorks are based in humid Memphis, Tennessee and have been producing world class speakers for just over 20 years. They found early popularity as the choice of legendary mastering engineer Bob Ludwig, during which time they became well known in recording circles. Soon after that the high end home audio crowd jumped on board and their line up expanded. 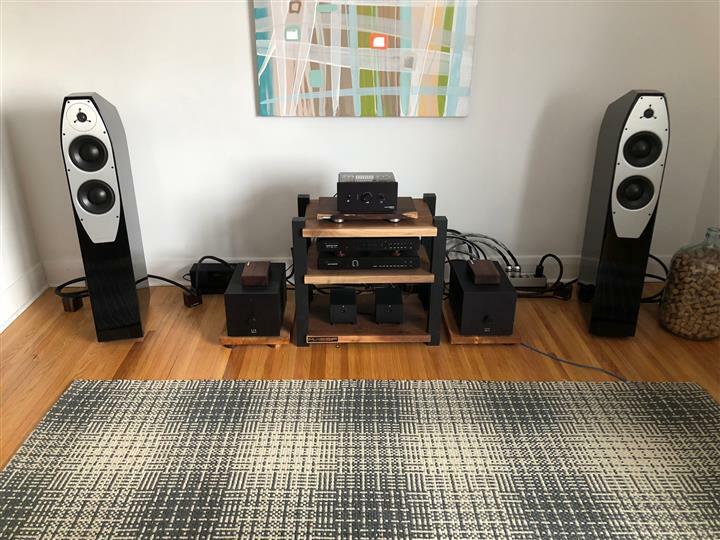 The brand new, and vastly improved, Emma EVOlution speaker ($5,490 US) stands as their entry level floor stander, positioned in the company’s line between the Nico stand mount speaker and the larger Kiva floor stander. The build and finish quality of these models is astonishing. Never being prone to hyperbole, I can safely say these speakers are among the best looking speakers I’ve ever seen. 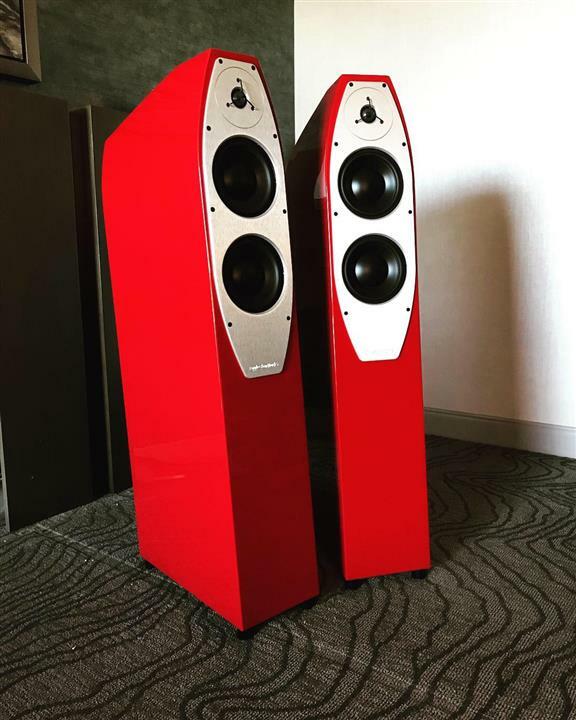 Everything from the beautiful enclosure, the machined aluminum faceplate, the carbon fibre rear plate, to the chrome binding posts… EgglestonWorks left no stone unturned when designing these speakers to stand out in a market that already offers many good looking speakers. Technically, the Emma EVOlution combines a 1-inch fabric dome tweeter with dual 6-inch drivers. 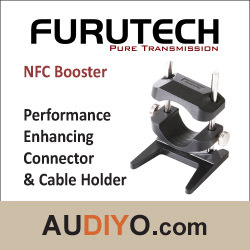 It offers a frequency response rated from 32 Hz to 24 kHz, a sensitivity of 88 dB and a nominal impedance of 6 ohms. It has a footprint of 7.5″ x 16″ x 43″ (W x D x H) and weighs 69 lbs. Its cabinet, internal bracing and porting system are derived from the technology originally developed for the company’s higher end Viginti Limited Edition and Kiva loudspeakers. I spent several weeks with these speakers and found that they are not particularly finicky about their placement, unlike their predecessor model called the Emma SE, which have been in my system for a while. At first listen, I found that the EVOlution model delivered the same kind of sound as the excellent sounding Emma SE model but now there was considerably more thunder. 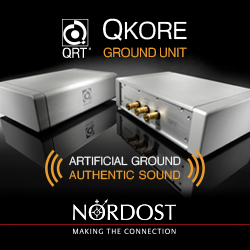 Through a total redesign, company President Jim Thompson and VP John Callery aimed for this new model to push low frequencies that normally don’t get associated with speakers of this size. Thanks to an innovative use of a slot / shelf rear port they have achieved low end frequencies that easily hum a 32 Hz bass line. That’s high 20’s in a well thought out room. The use of mid range drivers combined with this new port and cabinet design and a totally reworked crossover have produced mid range bass that’s both taught and detailed. Very believable and compelling. The lows aren’t as earth shattering as their behemoth big brother the Viginti , but in all honesty not far off.